Wall Shelves that with drawers are much functional than single layer floating shelf, brackets support shelf or cube shelf. 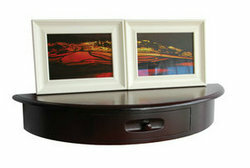 Top of shelf can be used to display pictures, collectings or place keys. Important things can be stored in below drawers. These creative wall shelf are presented with high quality and beautiful appearance, you can not imagine how it would like if install one to the wall. Full colors availiable for selection.